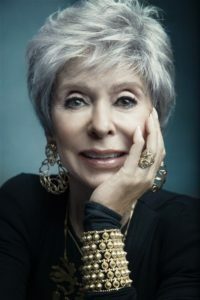 Join us for a very special evening with the legendary Rita Moreno. “If You Quit, You Can’t” memorializes the decades of accomplishments in her storied career. Ms. Moreno was the very first performer to win an Oscar, an Emmy, a Tony and a Grammy. Creative diversity has been the hallmark of Ms. Moreno’s 70-year career. She belongs to an elite group of only 15 living performers who have won entertainment’s grand slam of the industry’s most prestigious awards: The Oscar, The Emmy, The Tony and The Grammy. Her Oscar came in 1962 when she starred as the Latina spitfire, Anita in West Side Story for which she also won The Golden Globe. The Tony win was for her 1975 comedic triumph as Googie Gomez in Broadway’s The Ritz. The Grammy was for her 1972 performance on The Electric Company Album, based on the long-running children’s television series. She won not one, but two Emmys–the first for a 1977 variety appearance on The Muppet Show and the following year for a dramatic turn on The Rockford Files.